These photographs appered yesterday in The New York Times. 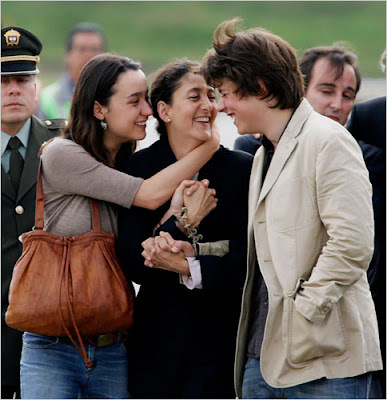 They show Ingrid Betancourt, freed after six years as a captive of fanatics, reuniting with her daughter and son, Melanie and Lorenzo. They are, quite literally, touching. Both images reveal the deeply tactile sources of the connection between parents and children and the energy that emanates from that source. Here we can plainly see Betancourt's hands absorbing her children's physical presence. What struck me immediately was her passionate grip on their hands and how she pressed her palm to her daughter's cheek. That touch and the energy it releases, multiplied innumerable times, is part of what fanatics, whatever their variety, eliminate from the world.